Bicc1 perturbation alters BMD in vivo. Femoral BMD at 12, 16, and 28 weeks of age in male (A) and female (B) Bicc1+/jcpk (red) and Bicc1+/+ littermate controls (black). 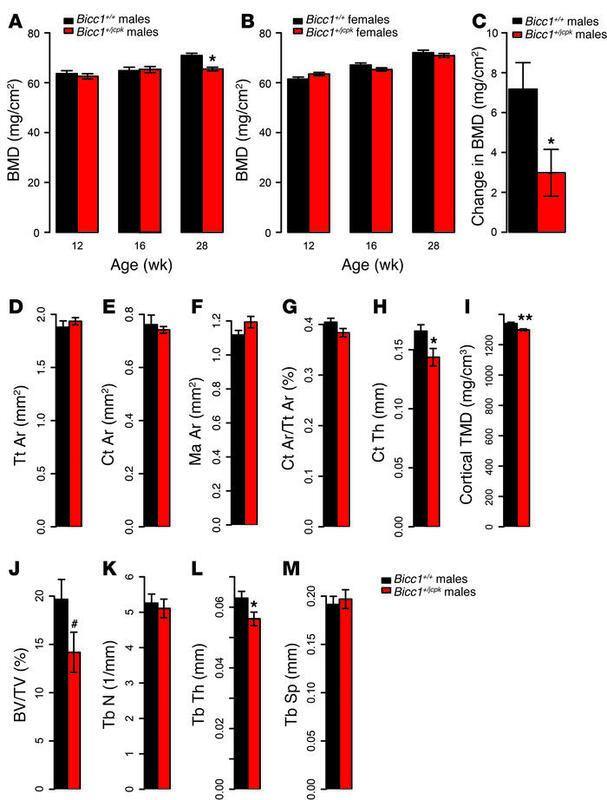 Change in BMD between 12 and 28 weeks of age in male Bicc1+/jcpk and Bicc1+/+ littermate controls (C). Cortical bone parameters at the femoral diaphysis determined by micro-CT in 28-week-old male Bicc1+/jcpk mice and their Bicc1+/+ littermate controls (D–I). Trabecular bone parameters at the distal femur determined by micro-CT in 28-week-old male Bicc1+/jcpk mice and their Bicc1+/+ littermate controls (J–M). Tb N, trabecular number; Tb Sp, trabecular separation. Data presented in all panels are the means ± SEM. #P < 0.10; *P < 0.05 ; **P < 0.01.